Franklin Square was located in Manhattan at the intersection of Pearl, Cherry, Dover and Frankfort streets. It was near the piers of the Brooklyn Bridge where Pearl St. passes beneath the entrance ramps. It can be seen clearly on a map dated 1857-62 on the New York Public Library's Digital Collections (this map is a bit tricky: north is at the bottom!). The square was severly impacted by the construction of the Brooklyn Bridge (built 1870-83). In modern (21st century) times Frankfort St. runs more or less straight into Dover St., and Cherry St. has been completely obliterated. The Pearl St. crossing looks like a normal intersection, and no trace of a square is to be seen. For many years Franklin Square's most prominent inhabitant was the cast-iron headquarters of Harper & Brothers publishing company. Designed by America's cast-iron innovator, James Bogardus, the Harper Building at 333 Pearl St. was erected in 1854-55 and remained in Franklin Square for 70 years (until 1925). The Square had elevated subway stations on both the Second Avenue El and the South Ferry branch of the Third Avenue El (images of the 3rd Ave. elevated at Franklin Square are available at nycsubway.org), and was described in Moses King's Handbook of New York City (1893) as follows: "Franklin Square is only known and only important because the firm of Harper & Brothers still keep their publishing house there. A century and less ago this was one of the fashionable quarters of the town. The old mansions have disappeared, and a tenement-house population and small manufacturing establishments now occupy the land. The square is pretty well covered over by the network of tracks and depots of the Elevated Railroad." The Franklin Iron Works were located at 1 Franklin Square from 1919 to 1949. (In the early 1940s they also became known as Franklin Square Iron Works.) In 1950 they moved to 81 Murray St., then a little later to 75 Murray St. In 1986 they left New York and moved to Union City, New Jersey. Currently (Feb. 2010) the company website is Under Construction, but a Company History image shows four successive company presidents: Sam Singer (1919-1950), Julius Singer (1929-1970), Ron Singer (1968-1990) and Rich Singer (1982- ). A fifth generation Singer, Ryan Singer, appears as vice-president (1999- ). Internet sources give the current(?) (2010) company address as 372 Dartmouth St., Wyckoff, NJ, 07481-3152, phone: (201) 612-1995. The founder of Franklin Iron works was Simon Singer (1884-1967). He was also called Sam Singer. He was an immigrant from Hungary / Czechoslovakia in 1901, who registered for the World War I draft in 1918, giving his date of birth as 22 Jan. 1884. At that time he worked as a "ship fitter" in Hoboken, New Jersey. He is recorded in the three successive U. S. Census reports for 1910, 1920 and 1930. In 1910 he lived on Bathgate Ave., the Bronx, and gave his occupation as "iron worker." His son, Julius, age 2, was recorded as his daughter, Julia. In 1920 the census taker correctly identified Julius as his son, age 12, and the family lived at 609 East 170th St., the Bronx. In 1930 they lived at 855 Faile St., the Bronx, and Julius no longer lived with the family. Simon (Sam) Singer's second generation successor at Franklin Iron works was his son, Julius Singer (1907-1990). 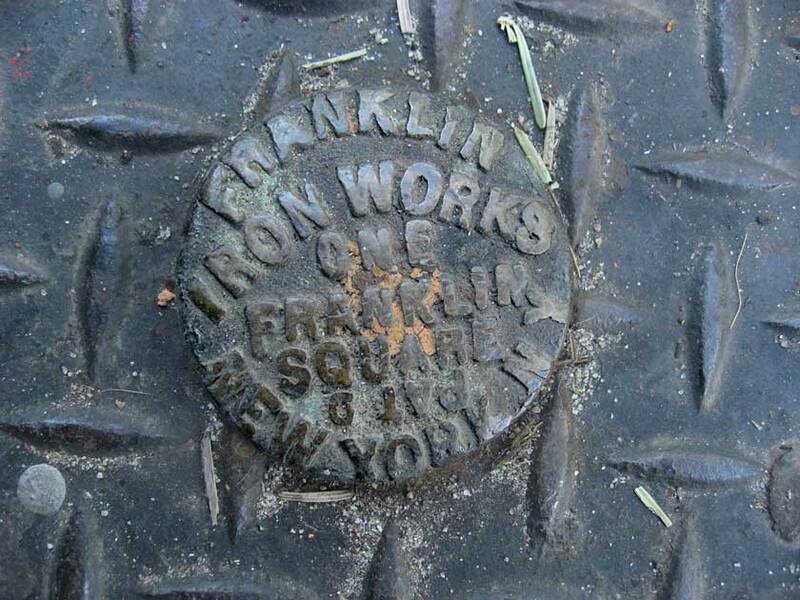 Another Franklin Iron Works knob is embedded in a manhole cover at the corner of the Bowery and Grand St. (click for image). Another knob in a sidewalk basement door marked "Franklin Square Iron Works" is found on East 46th St. (click for image). This carries the foundry's address in Union City, New Jersey. A sidewalk grate marked "Franklin Square Iron Works" is available on Flickr at www.flickr.com/photos/ultraclay. A manhole cover marked "Franklin Iron Works" is available on Flickr at www.flickr.com/photos/nicksherman. Nick Sherman's manhole cover is located on Mulberry St., New York City. The image includes a note, pointing out that what looks like "Pat 9" is for some reason upside down... This is true on my images also. Why upside down? And what does Pat 9 mean?